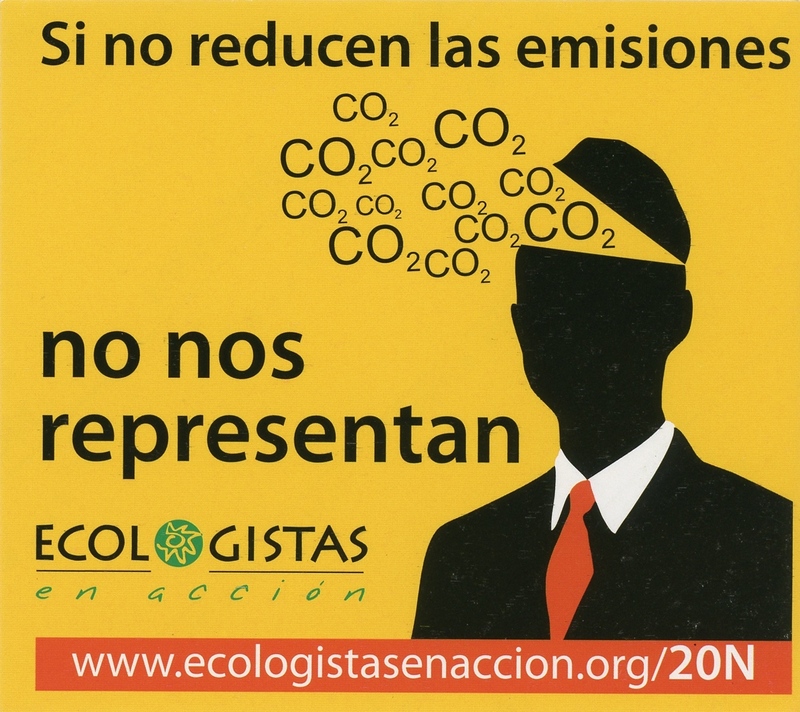 No Nos Representan -- Ecologistas En Acción -- CO2. If They Don't Reduce Emissions They Don't Represent Us -- Ecologists In Action -- CO2. This sticker shows a man in a black suit with a red tie. There is a triangle cut out of his head that has the words CO2 coming out of it. It was created by the organization Ecologistas En Acción, an environmental advocacy organization made up of 300 Spanish ecological groups. They take a social environmental approach to counter degredation in Spain, a country that has been evironmentally exploited by the policies of neo-liberal politicians. At the bottom of the sticker is a link to an article from their website where you can find this sticker along with five others in the same sticker campaign from November, 2011. The stickers in the collection remark on issues such as their disapproval for things like destroying biodiversity, not opting for renewable energy, supporting the banks, defending nuclear energy, suporting social cuts and in this particular sticker the disapproval in political parties that don't prioritize reducing emissions. This campaign is consistent with the organizations mission, which is to combat the effects of globalization and capitalism that adversly affect the environment and create broader social problems.